Buy tickets online via the red button below. When middle-aged man Greg found Sylvia (a stray dog) in Central Park New York and brings her home, it is love at first sight. But his wife Kate, a busy rising star in her teaching career, is looking forward to some independence now that the children have gone to college. She is less than thrilled by the clever and coquettish canine who jumps, slobbers, sits on her couch, and takes Greg’s attention away from his marriage. After “trying for a few days”, will Greg be prepared to make the ultimate choice between Kate his wife and Sylvia the dog? 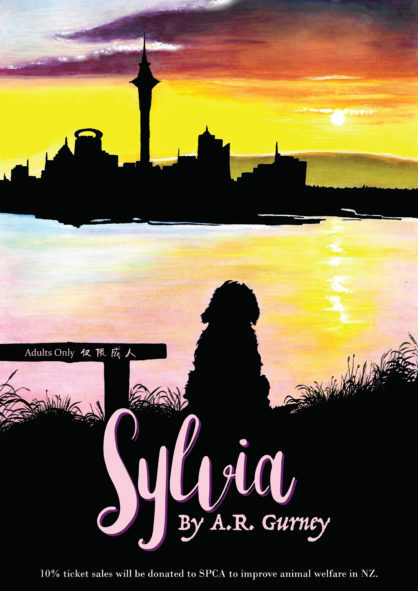 Sylvia is a classic Broadway comedy by A. R. Gurney which was premiered in 1995 (so that makes it pretty old in dog years), produced by Manhattan Theatre Club, Original funds provided by Milkbone. This Play has been selected by Felix Creative Theatre as their first full English production (all casts speak English as their second language). Come and enjoy this smart, silly, bold, and occasionally salty comedy about relationships, nature, and growing older. This play contains offensive language.